Home » Goods.ph » Lacoste » Tote Bag » Lacoste Tote Bag: Preppy Fashion Indulgence! Lacoste Tote Bag: Preppy Fashion Indulgence! 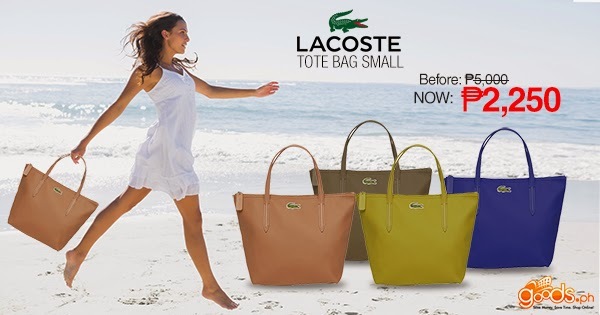 Lacoste Tote Bag for as low as P2,250 only at Goods.ph! Spoil yourself once in a while and buy this specially discounted Lacoste Tote Bag as a long awaited gift to yourself! Better yet, tell your boyfriend or hubby to buy it for you as a sign of their undying love! Hahaha! Well, who knows? This tactic just might work, no harm done, besides you’ll get a new bag if they do fall for it! Feel chic and classy every time you use this functional and durable Lacoste tote bag. Preppy and sporty at the same time with a clean-lined design and 100% PVC water resistant polyvinyl chloride material which makes your Lacoste Tote Bag water resistant, adding resistance to dirt, chemicals and UV rays which helps extend its color fastness. The well renowned Lacoste green crocodile design is made from 100% Leather and embroidered on the bag. By the way, to really make choosing your new Lacoste Tote Bag shopping a wonderful experience there’s a variety of fashionable designs and colors to choose from to suit your sophisticated taste. Choose from navy blue, army green, orange, bronze, lime green, royal blue, silver, spring green and yellow to match your every attire. The Lacoste online shop sale is a limited offer only so don’t miss this once-in-a-lifetime opportunity to own an original Lacoste Tote Bag at a cheap price. Imagine, you pay just P2,250 for an original Lacoste Bag that usually costs around P5000! Truly a bargain worth spending your hard earned cash on, don’t you think?